﻿ COMMUNIST CHRISTIAN - Can A Communist Be A Christian And Vice Versa? 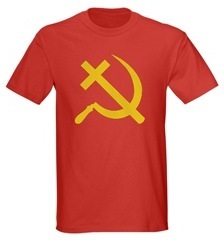 Communist with or vs. Christian? 1. Does Christianity threaten the Communist Party? The Communist Party has warned you that Christianity is "spiritual opium" that threatens the Communist Party and China, but is this true? Opium addicts lie around, become burdens to the society and commit crimes to get the money to feed their addictions. Is this what Christians do? Of course not. As you know, Christians work hard, pay their taxes without cheating, and use their money and time to help the poor. Instead of threatening the Party, Christians are model citizens who help the Communist Party govern China. 2. Will Christians threaten the Communist Party later when they grow in number? While Muslims blow up buses in Urumqi and Buddhists burn down government offices in Tibet, have you ever heard of Christians doing the same? 3. The Chinese society needs Christianity. As China becomes increasingly materialistic and the income gap between the rich and the poor widens, people care more and more only about money and less and less about each other (see China Threat). Do you truly believe that the ideologies of communism will keep China a caring, harmonious society under these pressures? Don't the facts already speak for themselves?